iPOS-5000 is our latest innovation of smart card readers. It offers a small and elegant enclosure packed with features. The iPOS-5000 is powered by a highly configurable application capable of supporting the most demanding applications. The iPOS-5000 offers an extensive set of configuration parameters and the most comprehensive reports set in the industry. It is also capable of e-mailing reports at pre-determined intervals. 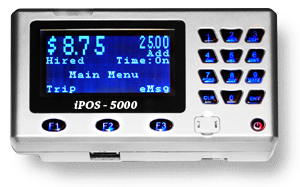 In this mode the iPOS-5000 provides or denies access to the controlled equipment based on the balance stored of the presented card. In this mode the iPOS-5000 operates completely as a standalone controller and requires no communication with a host or a master. In this mode the iPOS-5000 is used to revalue the balance stored on the presented card using the attached keypad. Simply key in the new balance to revalue the inserted card. In this mode the iPOS-5000 used to format and revalue blank cards. The inserted card will get formatted and encoded with a pre-programmed value stored in the internal settings table. In this mode the iPOS-5000 is fully controllable using a communication protocol. The Controlling host will have full control over the reader and the balance of the presented card.